We would like to express our deep gratitude to Chuck Wild for the assistance his music provides to our work. All of our channeling is done with the assistance of Chuck Wild's Liquid Mind music for relaxation and meditation.This channeling was done using the "Dream: A Liquid Mind Experience" album. Please remember that sighs and pauses are indicative of great emotion or something of great importance that has been spoken. 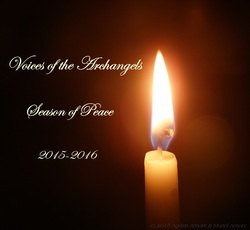 This year's Season of Peace celebration marks the fifth year we have shared the messages of the Archangels here. We have been asked a number of times if we would consider accepting donations as a way of saying thanks. We do share these messages freely with all the world as our gift to you from the Foundation and from Guidance. A simple thanks is enough for us. However, if you feel moved to make a donation to express your appreciation, you may do so here. Thank you, and please enjoy the Season of Peace! “Yes, then, it is I, the Archangel Gabriel, and I would speak to you at this time on the gift of Freedom, specifically as Freedom pertains to Peace in this time and space and place and dimension and so on, particularly in the dimensional shifts that are about to come. First, let me ask you: What is Freedom? Do you know true Freedom, or do you know the Illusion of Freedom? This I would ask of you. Many of you believe that you know what Freedom is. You have your definition that comes from the dictionary and so on. Freedom is an absence of control. That is what you might say. You are Free to do this. You are Free to do that. You are Free to do whatever you choose. And, I say to you that, in part, this could be considered Freedom, but it is certainly not Freedom in its greatest sense, its greatest potential. Freedom is FAR more than that. You see, you must consider Freedom in the aspect of repercussions of your choices. You must consider Freedom in everything that you do, everything that you say, everything that you think. in any of these things in your daily Life? Are your expressions of your thoughts hampered? Are you held back in any way? Are you Free to simply be who you are, and what you are? Now, we go back to Purpose. We go back to the core element of who you are, and what you are, and what you are in this lifetime to be. Who are you meant to be in the world at this moment in time? You have your Karma to work out. You have lessons to learn. You have a Purpose to fulfill. And, you have a Greater Purpose to fulfill, for it is not just an individual Purpose, you must know this. None of you are here to fulfill only an individual Purpose. And, in that respect, you are ALL here to assist in the birthing of a great new dimension, a great new Time and place and space where people can live together in Peace and in Harmony. But, let us talk about individual Purpose for just a moment. Are you Free to fully experience and express who and what you are? No. You are not, for most of you do not know who and what you are nor what you are here for. And, until you do, you are not truly Free. And, only you can Free yourself in that respect. then you find your true Freedom. then you may share it without. You may share it outside with others. And, you see, as you begin to do this, then you do not find the need for greed, and control, and manipulation, and violence. Not only in not doing it yourself, but you also find no need to be party to it with other people whether they are in individual relationships with you, whether they are relationships at a community level, a state level, a nation level, a world level, and so on. You have no need of these things anymore. They become mute points. They are petty. They have no value to you. And, you are more easily aware of these things when you are in your own state of true Freedom. In case you have not noticed, each of the gifts of the Dimension of Peace that we are celebrating here, that we are discussing here, and learning and sharing information with you on – they all reflect a state of being, not a state of doing. before you can be in the state of doing. These are not action forms. These are states of being. They are not states of action. And, you see, when you are in your state of Freedom, you are who you are. You are doing what you are meant to do. There is nothing, and no one who can stop you. And, none should ever fear this state of Freedom. You should never fear it in another. Who among you will take the word of someone who can stand before you in their Complete state of Freedom and simply say, “I am who I am”? Not many of you, I would guess. Do you know how to reach inside and find your Freedom? And, I would venture to say that most of you do not. You must go within your own Heart. follow the path of Love. Look inside. Find out your Truth. Find your Peace. Come to know who you are. Come to know what you are. For some of you, this will happen within moments, because you are so ready for this great Transformation. And, yet, others of you, it will take days, or months, or years, and yes, some of you will take even lifetimes. But, persevere. Do not give up. This is your greatest Joy. This IS the greatest Freedom you will ever have. And, you will find that once you come into connection with this Freedom, nothing else will satisfy your need for Freedom. There are so many today in your world, who are fighting – purportedly for Freedom. And, in Truth, it really is the Illusion of Freedom that you are fighting for, for you are fighting to get rid of one set of controls so that you may live under another set of controls. They are only an Illusory set of Freedoms that are masking controls behind them. And, there are those that say, “We cannot live in true Freedom. One of us would run over the other.” And, I say to you this is not true. That is only the Illusion of Freedom, for real Freedom, as I said, comes from within. And, it comes from a place of Love and Joy and Peacefulness and Grace and so on. when you begin to find who you are, your Freedom will come in little bits. “I am Free to be me in this respect. I am Free to be me in that respect.” Choose the things that come to you as being most important. by the way the voices of them haunt you in your mind. When the little voice is in your mind, and it won't go away, that is usually the voice of the Heart speaking. “I need to be Free.” And, as I said, there are so many of you fighting in this world, wanting to be Free. You want Freedom from this regime. You want Freedom from this bunch of laws. You want Freedom from this oppression, and so on and so on. And, this is a reflection of a greater need within each and every one of you to find your real Freedom, the Truth of Freedom, the Illumination of Freedom, which is inside you, because this is a Time when each of you is meant to shine. You are meant to be the Lights and the Love that you are. You are meant to fulfill your Purposes right here right now in this lifetime. For some of you, this is your last lifetime. Therefore, finishing and fulfilling your Purpose is of paramount importance to you. Others are just beginning. You see, the world is a mixed bag right now, you might say, where the Earth population is concerned. You are at a crossroads in your world and in your lives – many of you, those who are beginning lifetimes, those who are ending a series of lifetimes, and so on. But also, the Earth is at a crossroads. It is time for changes. And the question for each of you is: Which side of the changes will you be on? Will you live more in Illusion, or will you live in Illumination now? Where is your Freedom calling to you? Are you willing to let go of the convenient Illusions in order to live the inconvenient Illumination of real Freedom? If you must bargain, you are dealing with Illusion. It does not matter whether you are speaking about a law in your world, a benefit of your world, a relationship issue, even with yourself. You look into your mirror and you say to yourself, “If I have to give up my Freedom to do this, to have that, to be someone else”, then I say you are dealing in Illusion. This will never bring you Joy. It will never bring you more than momentary satisfaction. It will not lend itself to your Life in any way, shape, or form. Sometimes you must put aside what you might term as the “party favors”, the party gifts. And, you must face reality. And, sometimes real Freedom is far deeper than the convenience of quick and easy. Sometimes, if it is real, it is worth waiting for, working for, striving for, digging for, and more importantly evolving for. What about your food, for example? Would you have Freedom with your food? Do you realize at this time how much of your food is dictated? Sure, you go to your grocery stores and you have choices. You can buy this. You can buy that. You can buy the other thing. But, are you seeing the parameters on what is available to buy? and eat whatever you wanted, whenever you wanted with or without money. Do you see where money, in many cases, is part of the loss of Freedom? Can you see where the parameters that define your choices are a loss of Freedom? You see, when you have to have parameters, there is no Freedom, because Freedom is endless and boundless. It does not have boundaries. It does not have parameters. And, some of you would come back and say, “Sure, I grow my own garden. I grow my own food. I have my own farm. I live off the land. But, the weather only allows me to grow this, this, and the other thing.” And, I say to you this is true. conditions, her gifts. This is what she's giving to you – the ability to do these things. But, within those things, you may do anything. There are places in the world where anything will grow. And, yet there are places in the world where nothing will grow. and the issue at the moment is Freedom. And, I believe that you Understand the illustration then, the parameters put upon your Freedom. You see, as we speak of unconditional Love, and unconditional acceptance, and so on, and so on we must also consider unconditional Freedom. If your Freedom must have conditions, then it is not Freedom. Period. End of story. Think about that for just a moment. it is not real Freedom. if you have to give up something in order to gain Freedom, then it is NOT Freedom. It is Illusion. It is the Illusion of Freedom. You have traded one set of controls for another. So, how does your world experience real Freedom without making sacrifices? shine your Light. Share your passions. Join with one another. Accept each other unconditionally. Love each other unconditionally. Recognize the states of Grace of each being of Life. Live your own, and allow others to live theirs. This is where you find your Freedom. This is where real Freedom happens. And, all it takes is for all of you to stop for just a moment, and put aside the blinders, the shackles of Illusion. And, then start seeing it. See where it has been taken from you and claim it back. Come together and share. And, do not step upon another person's Freedom. Allow them to have their Freedom. nor did they have theirs. It doesn't matter how many people populate the Earth. There is no need for fighting ever. There is no need for violence. And, some of you would say, “But, Gabriel, it happens. We can't control what someone else does down the street. If a person wants to go insane and shoot up the world, or if a leader causes bombs to be dropped, and so on and so on, we have no way to stop this.” And, I say, yes you do. Send Love out, every day to every being everywhere. Then, it doesn't matter who might have had the inclination to be the shooter or the bomber or someone with a gun in their hand somewhere else in the world, or a knife, or a machete, or a high heeled shoe, or whatever it might be. You are addressing the Hearts of every living being. And, the more Love you share the greater Freedoms they will feel, the greater Freedoms you will feel. And, as you begin to feel more and more Freedom – you find it little bit by little bit – the other person also begins to feel the Love working in their bodies, working in their Hearts, soothing the hurts, easing the pains. And, you see, eventually with more and more and more of you doing this, sending out Love, then Love will reign supreme and Illusion will be no more for it is no longer needed. Illusion only exists because you need it, because you haven't chosen Illumination. And, you have the Freedom to make this choice right here right now. The choice is available to you to be made. And, then go find it. Look inside. If you have trouble, call upon me and I will assist you. There is no need for you to not be Free. In Truth, you already are, but you have allowed the Illusions of Freedom to shackle you to the point where you cannot see it, live it, experience it, express it. And, so I leave you with these words and my thanks for listening. And, I leave you with a great gift – the Gift of Freedom. (Note: The pauses are indicated through the spacing of the text. Sighs and long pauses are noted within the text (ie; (sigh)). © Copyright 2012-2018 The New Gaea Foundation Healing Arts Center™ and Mia Mona Muriel Amore. All Rights Reserved. No portion of this page may be reproduced, copied, or downloaded in any form or through any media without the written permission of The New Gaea Foundation Healing Arts Center™ and Mia Mona Muriel Amore.